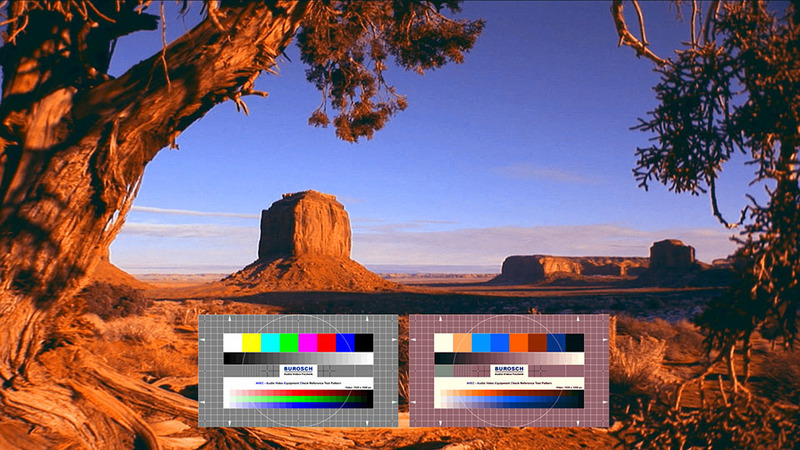 The Two Strip Color filter simulates the look of vintage two strip or three strip film color processes. Method: This pop-up lets the user choose between the additive method used in the earliest multi-strip color processes and the subtractive method used in subsequent implementations of multi-strip color. View: This shows the final output, any of the 9 record or dye layers. Bulb Color (Sub): This control is available only if the subtractive method is used, and lets the user simulate the effect of a faded or discolored projector bulb. Red Filter Color: This sets the color of the filter for the red strip that is used in exposing the layer’s black-and-white negative. Red Dye (Add): This sets the color of the dye for the red strip that will be used to tone the layer’s record print if the additive method is used. Red Dye (Sub): This sets the color of the dye for the red strip that will be used to tone the layer’s record print if the subtractive method is used. Blue-Green Filter Color: This sets the color of the filter for the cyan strip that is used in exposing the layer’s black-and-white negative. Blue-Green Dye (Add): This sets the color of the dye for the cyan strip that will be used to tone the layer’s record print if the additive method is used. Blue-Green Dye (Sub): This sets the color of the dye for the cyan strip that will be used to tone the layer’s record print if the subtractive method is used. Grain On: Adds grain to the image similar to the grain in the BCC Film Damage filter. The grain auto-animates. Grain Amount: Sets the amount of grain. Grain Size: Sets the size of the grain particles. Saturation: Scales the saturation of each pixel. A value of 0 produces a monochrome image. Brightness: Scales the brightness of each pixel. A value of 0 produces a black image. Exposure: Brightens or darkens pixels that fall below the exposure cutoff level. Mix With Original: Blends the source and ﬁltered images. Use this parameter to animate the effect from the unﬁltered to the ﬁltered image without adjusting other settings, or to reduce the effect of the ﬁlter by mixing it with the source image. Red Gamma: Controls the Gamma of the red color strip. Red Intensity: Controls the intensity of the red color strip. Blue-Green Gamma: Controls the Gamma of the Blue-Green color strip. Blue-Green Intensity: Controls the intensity of the Blue-Green color strip. Color 3 and 4 Layers On: This activates two extra colors that can be added to the animation.